Last week, I had planned to write a single post talking about how to write non-human characters, such as animals, aliens, mythical creatures and so forth. Unfortunately, it turned into such a long post that I decided to chop it up into a series of posts instead. This week’s post is the second instalment on writing non-human characters and today I’m going to focus on how to write aliens from other other worlds. If it’s animal characters you’re interested in, that was covered in last week’s post, which you can see by clicking here. If, on the other hand, it’s robots or mythical creatures you’re after… well, you’ll just have to wait. Your audience is made up entirely of human beings; therefore, your audience must be able to sympathise with your characters as human beings. In other words, if you want your audience to sympathise with your character, you need to give them certain human qualities. In doing this, you anthropomorphise your character; that is, you humanise them in the minds of your audience. The more human they are, the more easily they can be related to. So, with that in mind, let’s have a think about aliens. Unlike animals which are very common and familiar things in real life that science has taught us a great deal about, we know nothing about real sentient alien life. We can’t even be certain that it exists at all. However, if it ever turned out that sentient alien life actually did exist, it would almost certainly have very little in common with us Earthlings. There’s absolutely no reason to believe that they would share human values and culture (or even understand concepts such as ‘values’ and ‘culture’), walk on two legs, communicate with spoken language, listen to music or do any of the other things humans do. Culturally, socially, philosophically, anatomically and in every other way, they would almost certainly seem bizarre to us in the extreme. After all, we humans often find it hard enough to relate to other human cultures, never mind alien ones! It is, of course, certainly possible to create “realistic” aliens like this for your story. Unlike with animal characters (who you probably will want your audience to relate to), it can sometimes be beneficial to have aliens who are bizarre and impossible to relate to, depending on the kind of story you’re writing. Many have done it already to great effect. However, it is worth remembering that there is a reason these “realistic” aliens are very seldom portrayed as good guys. They’re not even usually portrayed in the same way as traditional bad guys, who will usually still have goals and motives that we can relate to and sympathise with (even if we don’t approve). Instead, such aliens are usually portrayed as destructive (or at the very least, strange and frightening) forces of nature. The aliens in War of the Worlds or Alien are good examples. These characters, while believably alien, are more of a danger to be overcome or escaped than a character to be related to. Because your audience cannot sympathise with them as people, it makes it an almost(!) impossible task to create aliens of this type who fit into any traditional role for a character to play. Remember, the weirder your alien is, the less your audience will sympathise with or even understand them. This can be a great boon to authors who want to create terrifying monsters, but not to authors who are trying to create relatable people. Contrast this with the types of aliens you are perhaps more used to seeing in popular science fiction such as Star Trek or Doctor Who. They sit somewhere in the middle of the alien-human spectrum. They might have one or two physical features that make them look alien, such as blue skin, pointy ears or strangely shaped foreheads, but they still basically look human-ish with mostly recognisable human body parts in roughly the correct place. They will usually have one or two cultural or social quirks to keep them from seeming too human (for instance, the Vulcans in Star Trek are famous for their logical and stoic minds) but nothing so bizarre that it defies understanding. After all, humans often do appreciate logic; the only difference is that Vulcans have founded their entire culture upon it whereas we have not. This makes them seem exotic, but relatable. Such aliens are not terribly realistic when you analyse them closely, but they’re sufficiently different from humans that the average audience will accept them as aliens while still being able to sympathise with them as people, rather than monsters. Beware, however, that you do not go too far in trying to make your aliens relatable. Aliens are, by their very nature, foreign in the extreme. Your audience, then, will expect your alien characters to be at least a little bit unusual. If they seem too human, you will have utterly failed in your goal to create an alien character. For example, one of the biggest things that irks me about Supergirl (the TV series) is the character of Mon-El who, having only just arrived on Earth from the planet Daxam, is utterly indistinguishable from the average American millennial in the way he talks, behaves and relates to other characters. This level of anthropomorphising goes too far and robs the audience of their ability to believe that the character they’re witnessing is really from another world at all. Sure, he’s a relatable character but remember, it’s important when writing sci-fi to suspend your audiences’ disbelief. Your audience will not be able to believe in an alien who seems more human than their own family do. Creating alien characters, then, is all about balance and purpose. Before you begin, ask yourself: what is the purpose of this alien to be in my story? Are they a protagonist, antagonist, love-interest, etc.? Why exactly are there aliens in this story? This will determine to what extent your audience (and indeed, your other characters) will need to be able to understand and relate to them, and consequently, will help you to determine how alien or human they should appear. However, let’s be clear on one thing: this is not the same as creating a balance between how good and how evil your character is. Rather, it’s a balance between the familiar and the strange. Very human characters can still be bad guys. Very alien characters might even be good guys, although it’s unlikely that the audience will relate to them and so I would be very careful about how you go about doing this. That’s all I’ve got time for this week I’m afraid, but be sure to come back next week when I’ll be continuing the series on creating non-human characters, this time focusing on robots and cyborgs. Sometimes when you’re in the planning stage of constructing your story, it can be difficult to keep track of all of your ideas – especially if you’re still undecided about what ideas you’re going to use and what ideas you’re going to discard. Figuring out timelines of individual characters, their relationships to one another or the history of your fictional world (particularly for us fantasy/sci-fi types) can be a complex process. I spoke before about how I like to brainstorm in a notebook, but notebooks have one major weakness when it comes to refining your story: they’re a bit on the small side. Even if they have a million pages, you still can’t spread out all your ideas in front of you at once; much less easily organise and rearrange them. Corkboards or spreading out your notes on your kitchen table is one way around this, but they have limited room too (they can also get really untidy and that can leave you feeling more confused than ever). There is plenty of mind-mapping software out there, of course, but its usefulness can be limited if you’re experimenting with many different ideas at once, because they force you to make logical connections between each note. Thankfully, the good people who gave us Scrivener have done it for us again. At first glance, Scapple by Literature and Latte might appear to be just another piece mind-mapping software claiming to possess the secret of eternal creativity but in actual fact, it is quite different in a few important ways; ways which make it the ideal tool for those of us who have a million different ideas they need to organise and have been unable to find a large enough whiteboard or a thick enough packet of post-its. ‘Freedom’ is the word that comes to mind when I think about Scapple. Freedom to organise all your thoughts (however many, and however big or small) into whatever order you want, in whatever style you want and with remarkable ease. One of the main freedom-endowing features Scapple has is that it allows you to place notes anywhere on the board, which you may choose to connect or not connect to other notes as you see fit. If you want to link your notes together, you can do it using arrows, two-way arrows or dotted lines. You are also not bound to work from a single central note as you are in mind-maps (though you certainly could do this if you wanted to). Each and every note you add to your board will be a free and independent note, which you can connect to or disconnect from as many other notes as you wish – assuming you choose to join any of your notes together at all. You can also easily surround some or all of your notes with a ‘background shape’, which keeps them together. All of this makes it ideal for experimenting with many different ideas at once. If you’re like me, you probably find that colour-coding your notes is a big help when you’re coming up with new ideas. Fortunately, it’s easy to customise the style of your notes to make them look exactly how you like them. The bulk of the customisation Scapple offers is available through the non-intrusive ‘Inspector’, which includes two tabs: one for customising the note style of whatever note you have selected at the time, and another for customising the format of the overall board (background colour/image, default font, etc). By default, Scapple comes with a few pre-made note styles that you can easily select by simply right-clicking the note(s) you want but you will probably find yourself quickly wanting to create your own note styles that you can re-use. Fortunately, it’s easy to create re-usable note styles by simply creating one bubble in the style you want and then choosing ‘New Note Style from Selection’ in the Format->Note Style menu. Not only that, but you can also redefine pre-existing note styles and even import note styles from another Scapple board (saving you the hassle of re-creating your custom note styles every time you start a new board). You can also add images as notes simply by dragging the file from your File Explorer directly onto the board and of course, as this little gem was indeed conceived by the same minds which gave us Scrivener, you can easily import notes from Scapple into Scrivener simply by dragging them into Scrivener’s Binder. For me, however, Scapple’s usefulness doesn’t end once I’ve refined my basic idea. Once I’ve decided what story I am going to write, Scapple can be of further use for creating useful diagrams such as timelines. For the novel I’m currently working on, I used Scapple to create a timeline which allowed me to mark off where individual story beats came in and how this related to the progress of the protagonist’s character arc. This allowed me to see the whole functioning skeleton of my story, with all its individual elements working together in a format which was very clear and easy to work with. Additionally, the freedom Scapple gives you to add notes anywhere on your board meant that I could still easily add notes-to-self on any points which I was concerned about (of which there were a few!). I really would like to come up with a few negative points for the sake of giving a balanced review of this product, but its simplicity, ease of use and freedom to do what you want with it makes it a really great product with very few cons that I can think of (incidentally, I’ve also found a few other non-fiction related uses for it). It’s available for Mac and PC and is also available as a 30-day free trial (that’s 30 days of use, so you don’t need to feel under pressure to use it every day for a whole month) so why not give it a go? If it’s a way to organise and plan your novel that you’re looking for, I’m sure that Scapple won’t disappoint you. If you’ve ever dreamed of writing scripts for TV and aren’t quite sure where that golden opportunity is going to come from, might I suggest you have a look at this tasty free app I discovered. The Amazon Storywriter (developed by the good people at Amazon Studios, naturally) is a very neat little app for script-writing which formats your script for you as you go and saves your work online for you to access from any computer in the world. 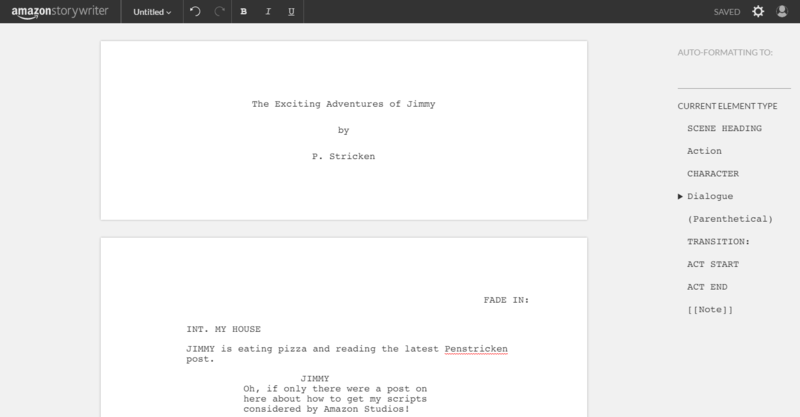 True, but unlike most others, this script-writing app will send your completed script directly to Amazon Studios. If it is accepted, your script might well end up being the next TV show or movie to be produced by the same people who gave us Bosch, Mozart in the Jungle and The Man in the High Castle. Tell me, dear would-be screenwriter, that you’re not a little bit interested. As far as I can tell from looking at their website, they are particularly interested in drama series, comedy series, children’s TV shows or movies, so you’re probably best restricting yourself to those genres (though don’t let me stand on your toes). I’ve not actually submitted anything yet (I’m getting there!) so I don’t have too much first hand knowledge about any issues that may or may not arise around creative royalties, contracts, copyright issues or anything else like that (therefore, I would strongly recommend doing your research before you submit anything – good advice any day of the week) but I can review it as a writing app. The interface is very simple. There are two tabs along the top: ‘Write’ and ‘Review’. The ‘Review’ tab is, unsurprisingly, where you go to review scripts that your friends have sent you. I’ll maybe talk about that another day, but right now I want to focus on Storywriter’s function as a script-writing app. So, let’s have a look under the ‘Write’ tab! Here we have a sidebar consisting of two fairly self-explanatory options: ‘Create a script’ and ‘Import a script’. ‘Create a script’, as you might guess, creates a brand new project which is automatically saved to the cloud. ‘Import a script’ allows you to import either text-based PDFs, FDX files or Fountain files (5MB or less) into Amazon Storywriter from your computer. Either way, what you’ll end up with is a very intuitive little writing environment: a page, already set up and ready for you to write (or continue, if you imported) your script. If, like me, your skills in proper script formatting are a little rusty, the sidebar on the right (or ‘element menu’, as it is called) will help you to format your script as you go along without having to spend a lot of time faffing around with line-spacing, margins, alignments and all that sort of thing (though I would still strongly recommend learning how to format your script properly and proof-reading it to be certain anyway). Your work will save automatically as you type and whenever you close your project, but there is, nevertheless, a big handy-dandy ‘SAVE’ button on the top right hand corner of the screen, if you crave that reassurance that only manually saving your work can bring. You will also find a small drop-down menu at the top-right of the screen. This is where you can make (fairly limited) changes to the layout of the editor: you can hide the element menu and you can toggle ‘typewriter mode’, which causes the editor to scroll as you type. Along the top-left of the screen there is a simple menu, most of which you will recognise from every other word processor you’ve ever used: undo, redo, bold, italics, etc. 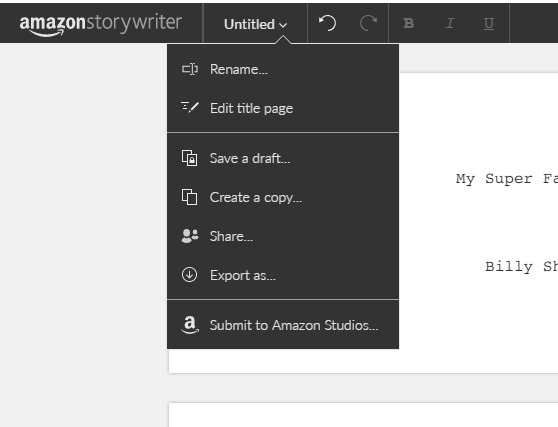 Clicking the ‘Amazon Storywriter’ logo will take you back to your home screen. There is also a single drop-down menu (which for some reason is labelled with the name of your project) which most closely resembles the sort of things you might find in a ‘file’ menu on most normal word processors, but there are some important differences. I’m not going to waste time explaining every option in the menu since most of them are self-explanatory but there are a few that are worth highlighting. First, this menu includes all your options for letting other people (specifically, your friends and Amazon Studios) see your work. Clicking on ‘share’ lets you send your script to whoever you like: friends, neighbours, dentists, anyone. All you need is their e-mail address and they will receive a notification asking them to review your script (they must accept this). If, however, you feel your script is as good as it’s ever going to be, clicking on ‘Submit to Amazon Studios’ will begin the step-by-step process of submitting your work to Amazon for consideration, so don’t use it until you’re certain your script is ready. Another useful feature in this menu is ‘Save a draft’, though it might not be exactly what you imagine it to be at first. Once you save a draft, it is saved as a read-only file that can not be edited. It can only be viewed, renamed, shared, exported, deleted completely or submitted to Amazon Studios. You can create as many drafts as you like (or at least, if there is a limit, I’ve not hit it yet) and you can continue to edit your script as before; only the draft files are read-only, allowing for easy redrafting without losing any previous drafts you might want to revisit. Every draft file can be found attached to your project on the home screen. If, however, you want multiple editable scripts for the same project, choosing ‘Create a copy’ from the same menu will create a brand new project identical to the one you’re working on at the time. The only thing it won’t copy over is your read-only draft files. As before, this copied project will also be available from your home screen and will not have any effect on the original project and its associated drafts. There is only one major thing this app does lack: any kind of planning environment where you can write up character biographies, storyboards and the like. This app doesn’t really come into its own until all your planning is already done and you’re ready to actually write a draft. Still, it’s a swish little app for would-be screenwriters, especially if you’re a beginner looking for an easy way of having your work reviewed by your peers and considered for production by a company who can (maybe, possibly, if you’re lucky) bring it to life for you. The app’s functionality may be a little basic in some respects (though there’s something to be said for that when writing, I find) but it’s certainly much easier to use than some more expensive apps and does the job well. Also did I mention that it’s completely free to use? In 1000 words or less, write what happens when a B-movie director gets stuck between floors in an elevator. Modern and stylish university building, surrounded by leafy green trees and basking in a brilliant sunset. No one is present in the lecture theatre, save for JOHN, an ageing bachelor, lecturer in English literature and b-movie enthusiast. In his spare time, he has even directed a few budget films. He is tidying up various papers, preparing to leave. The door opens to reveal SUSAN; a bright, vibrant young woman who must be intelligent because she goes to university. Sweet as chocolate strawberries dipped in sugar. Susan? What can I do for you? PETER becomes visible loitering behind the open door; a cocksure lad with an elaborate hairstyle and various accessories. A walking fashion statement. At that moment he is being uncharacteristically shy. He is SUSAN’s boyfriend. I was just looking for… um… my purse. I wondered if I left it here. Of course you were. Hello Peter! Well Susan, I’ve had lectures all day and nobody’s handed it in. Did you try the office downstairs? Oh, how silly of me! I’ll try there now. The elevator door is just beginning to close. JOHN runs towards it. PETER and SUSAN are there already along with RACHEL, a brilliant student of robotics. She is wearing a white coat and glasses, because she’s a scientist obviously. PETER and SUSAN are already talking with her when JOHN gets on the elevator. JOHN presses the elevator button and the doors close. The lift moves down. The PN-STKN Unit is also connected to the internet, giving it full access to the sum total of human knowledge. There’s still a few kinks to work out in its software, but at least my part’s done! Once it’s on, it’ll be almost indistinguishable from a real man. I bet it doesn’t do everything a real guy can. Not quite. He’s very gentlemanly. SUSAN and RACHEL laugh. PETER is humiliated. Robotic men… that’s silly, you only get those in movies. Heck, the one we had in ‘The Grim Robot’ sounded more plausible than this girl’s science project. Suddenly the lift shudders. The lights flicker and go out. Nothing. Lift’s probably just stuck. I don’t like small spaces! It’s fine, we’ll be out in no time. Won’t we professor? JOHN begins thumbing the emergency button. Nothing happens. He tries repeatedly, scowling. Maybe you need to hold it? JOHN holds the button and speaks into the speaker on the wall. There is an almighty bang from above. The lift begins to sway. Another almighty bang, as if something heavy has landed on the roof of the lift. SUSAN screams. A large, dark grey fist bursts through the ceiling. SUSAN screams again. It’s the PN-STKN Unit! It wasn’t due to be activated until next week! Well, it’s definitely active now… and it’s coming for us! The fist punches through the ceiling again, making the hole bigger. Humans are inferior! You must be destroyed! SUSAN screams. Two dark grey hands begin to pry the hole in the ceiling open even further. Quickly, how do we shut it down? You can’t, not if it’s gone active! I built it to be like a real man, only better! There’s no off switch! If only there was a bunch of jumped-up kids here, they’d know what to do! The hole in the ceiling is now wide enough for us to see PN-STKN; a dark grey man with obscenely large muscles wearing nothing but black briefs and a black leather waistcoat. His hair is black and slicked back. He happens to have a large circular saw in one hand, held close to the elevator cable. Humans… Stand clear of the doors. JOHN produces a gun from out of nowhere and shoots frantically but its bullets have no effect. PN-STKN shoots lasers from its eyes and vapourises SUSAN. I am your creator! Stop what you’re doing! The saw begins cutting through the cable with a shrill whine. He killed Susan! Why did you have to kill her?! She was no threat to you! Your emotion makes you inferior. You must die. No! No, it doesn’t! It makes us superior! Professor, what are you doing? PN-STKN hesitates. The saw stops spinning. Ok… you shot Susan, not Peter; yet Peter suffers. No, I’m not! I’m sad because… because I loved her man! And now she’s dead! It’s totally logical! There’s nothing more logical! Love makes you weak. Weakness makes you inferior. You have access to the whole internet don’t you? Well Google this! ‘Tis is better to have loved and lost than never to have loved at all’! Better, you see? Love is better than no love! Illogical. Love is weakness… yet is better?!! You did it! Next time, though, I’m taking the stairs! They laugh. The lift continues moving and the lights return. Smoldering robot parts litter the floor. A single disembodied hand begins to move!